MILLBRAE, Calif.--(BUSINESS WIRE)-- Luma Therapeutics, a company dedicated to eradicating suffering from inflammatory skin disease, today announced the launch of an innovative light-based therapy for the treatment of plaque psoriasis. The company’s FDA-cleared breakthrough technology, the illuvinate™ System, is an in-home treatment designed to provide lasting relief from psoriasis symptoms. 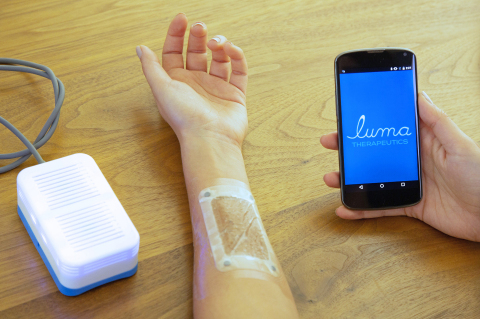 Illuvinate can now be prescribed either by a dermatologist or via Luma’s telehealth provider, HealthLens. The most effective treatment for psoriasis is the Goeckerman Regimen, a 100-year-old proven therapy that results in long periods of remission lasting between eight months to over a year.2 However this treatment is only available at a handful of specialized academic centers and often requires multiple day-long clinic visits over a period of weeks, creating barriers to widespread adoption. Luma Therapeutics has redesigned the key elements of the Goeckerman Regimen to make it available to patients in their own home. Based in Silicon Valley, Luma Therapeutics is a privately held medical technology company committed to developing innovative and convenient therapies for the millions of people around the world suffering from inflammatory skin disease. In collaboration with Mayo Clinic, Luma Therapeutics developed the FDA-cleared illuvinate™ System to offer patients with psoriasis an effective treatment option that can be used at home. The company has also been supported by StartX accelerator and the Rosenman Institute at QB3. For more information visit https://illuvinate.com/. HealthLens provides medical device companies with custom telemedicine solutions to access large numbers of patients and providers without the need for a traditional sales force. For more information visit www.HealthLens.com. 1 “Comorbidities Associated with Psoriatic Disease.” National Psoriasis Foundation, www.psoriasis.org/about-psoriasis/related-conditions. 2 Gupta, Rishu, et al. “The Goeckerman Regimen for the Treatment of Moderate to Severe Psoriasis.” Journal of Visualized Experiments, no. 77, 2013, doi:10.3791/50509. 3 Armstrong, W. “Online vs In-Person Care for Adults With Psoriasis.” JAMA, American Medical Association, 5 Oct. 2018, jamanetwork.com/journals/jamanetworkopen/fullarticle/2705854.